The Simple Network Management Protocol (SNMP) is used extensively in managing today's heterogeneous networks. Networking equipment from most vendors include an SNMP Agent that allows remote retrieval and configuration of its management data. This management data is defined in Management Information Base (MIB) files. SimpleMIBBrowser is an easy-to-use application that supports all versions of SNMP (v1, v2c, v3) and can be used to communicate with any SNMP enabled device. It can load device specific MIB files and display the management data contained within it as a graphical tree for easy navigation. SimpleMIBBrowser can then send SNMP requests of all types to retrieve and configure the management data of interest from the SNMP enabled device. SimpleMIBBrowser for NTCIP provides the same features as the standard version of the application with the added capability of communicating over a serial connection using PMPP as specified by the National Transportation Communications for ITS Protocol (NTCIP). The ITS Protocol support gives the engineer the flexibility of testing the agent using either ethernet or a serial connection. The serial parameters and the PMPP parameters are fully configurable. 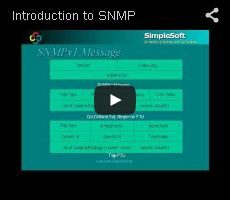 Supports all SNMP versions: SNMPv1, SNMPv2c, SNMPv3. Sends all SNMP request types: Get, GetNext, GetBulk, and Set. Loads both SNMPv1 and SNMPv2 SMI compliant MIB modules. Event receiver can display SNMPv1/v2c/v3 Traps, SNMPv2c/v3 Informs and even Syslog events. Displays SNMP table data in a tabular format that is similar to its corresponding MIB definition. Supports display of SNMP data in multiple windows for easy comparison. Includes multiple varbind support in all SNMP operations. Sends requests to both IPv4 and IPv6 SNMP enabled agents. Displays MIB information related to the selected management object in the MIB tree. Can get SNMP configuration from one device and duplicate on others. Monitors and plots performance graphs for selected variables. Saves SNMP packets received and sent in debug mode for resolving problems.